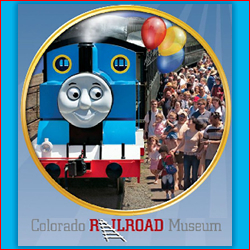 Thomas the Tank Engine will be visiting the Colorado Railroad Museum in September (weekends) for a Day Out With Thomas. At this very popular family event, you can experience a 25 minute ride on full-sized Thomas the Tank Engine, meet Sir Topham Hatt, follow great storytelling, music, and build with MegaBloks and more! Grab your tickets for this great childrens event – they go quickly!